Apple tried to make it in social media years ago, and it doesn't plan to revive that fantasy any time soon, says CEO Tim Cook. Apple CEO Tim Cook unequivocally tells PBS' Charlie Rose that the company has no plans to be in the social media business. "We have no plans to be in the social networking area," he tells Rose without hesitation. The question arose over the course of a two-part interview when Rose asked Cook: "Who is your competition?" To which Cook replied: "Google, clearly." When Rose prodded Cook further, he essentially balked at the notion that there may be others with an extended period of silence. While many in the technology space consider Apple, Google, Facebook and Amazon to be the strongest and most important platforms in existence today, Cook seems to take a different view. "When I think competitor, I would think of Google," he says, declining to name the other two as an actual threat. "I don't consider Facebook a competitor. I consider Facebook a partner. We're not in the social networking business," he adds. "We partner with both Facebook and Twitter, and we have integrated both of them into the operating system. So we work closely with both of them so that our customers can get access in a different and unique way to their services. 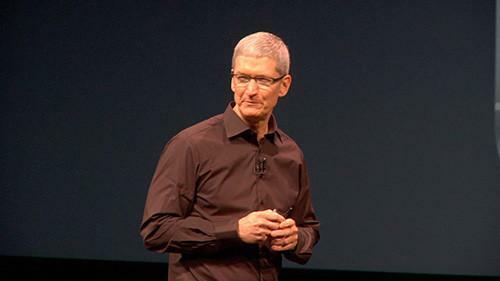 And we like both companies," says Cook. That strongly worded confirmation clarifies Apple's aspirations, or lack thereof, in social media but also puts one recent and anonymously sourced report into even greater uncertainty. If Apple plans to acquire the struggling mobile social network Path, as was reported by Pando last week, it would almost certainly be an acqui-hire. Path co-founder and CEO Dave Morin worked in product marketing at Apple for two years before he left in 2006 to take a job at Facebook for the next three-and-a-half years, so it wouldn't be completely random or surprising if he returned to the company with at least some of his team in tow. Morin declined to comment on the reported acquisition by Apple during an interview at TechCrunch Disrupt the following day, but that's pretty much par for the course in these situations. Rumors of an acquisition by Apple, whether true or not, are virtually guaranteed to drive up the perceived value of Path until the other shoe drops. During Cook's interview with Rose he reserved his most pointed criticism for the companies (including those he considers partners, apparently) that collect and sell data on their users. "We've taken a very different view of this than a lot of other companies have. Our view is when we design a new service we try not to collect data. So we're not reading your email, we're not reading your iMessage. If the government laid a subpoena on us to get your iMessages, we can't provide it. It's encrypted and we don't have the key. So the door is closed," he tells Rose. Days after the interview aired, Cook penned a letter on Apple's site that lays out the company's commitment to privacy in greater detail. "A few years ago, users of Internet services began to realize that when an online service is free, you're not the customer. You're the product. But at Apple, we believe a great customer experience shouldn't come at the expense of your privacy," he writes. "Our business model is very straightforward: We sell great products. We don't build a profile based on your email content or web browsing habits to sell to advertisers. We don't 'monetize' the information you store on your iPhone or in iCloud. And we don't read your email or your messages to get information to market to you," Cook adds. Apple's business is "based on selling these," he tells Rose, pointing to a pair of new iPhones on the table during their interview. "Our business is not based on having information about you. You're not our product... So we run a very different company. I think everyone has to ask how do companies make their money. Follow the money, and if they're making money mainly by collecting gobs of personal data I think you have a right to be worried and you should really understand what's happening to that data. And the companies, I think, should be very transparent about it." Apple Pay, the company's new mobile payments system slated to launch next month, is another example where Apple is determined to stay above the fray, he says. Apple doesn't want information about the purchases its customers will make with Apple Pay because "we're not in that business," Cook says. Back in the hot seat with Rose, Cook says he's "offended" by the troubling revelations made public by former NSA contractor Edward Snowden as he reaffirmed his belief in peoples' right to privacy. Apple never worked with a government agency from any country to create a backdoor to its servers, as was reported in the press, Cook tells Rose. "None of that is true, zero. We would never allow that to happen. They would have to cart us out in a box before we would do that," Cook exclaims. While Cook understands that it can be difficult to balance the needs of national security with individuals' right to privacy, he believes the U.S. government failed to find the right balance by erring too much on the "collect everything side." "I think it's a careful line to walk. You want to make sure you're protecting the American people, but there's no reason to collection information on you or 99.9 percent of other people," he tells Rose. Apple continues to make bets on the future under Cook's leadership, as he put it, but as should be expected at this point he was incredibly secretive about the details. "There are products that we're working on that no one knows about, yes. That haven't been rumored about, yes," he says. Very few of those products will see the light of day, and Apple has always liked it that way. "A lot of what leads to innovation is curiosity. It's curiosity to begin pulling a string and you see where it takes you," says Cook. "Most companies begin to do larger and larger portfolios because it's so easy to add. It's hard to edit. It's hard to stay focused. And yet, we know we'll only do our best work if we stay focused," Cook says. "The hardest decisions we make are all the things not to work on frankly, because there's lots of things we'd like to work on that we have interest in but we know we can't do everything great." Part one and part two of Rose's interview with Cook are now available in their entirety online.